Roots hair & beauty has a number of packages to offer our clients that will help transform your looks from ordinary to extraordinary. For all you “Mummys” to come and pamper yourselves after you drop your kids at school, or after your tennis/yoga/exercise class. We will give you our undivided attention with a Hair wash/blow dry and style as well as an Express Mani & Pedi, we will then throw in a complimentary “Oh so lovely” Neck, shoulder and scalp massage with the lovely Ni all for QR300 only! I think you’ll agree it is great value for your money. So why not take some time out for “you” before you are back on the school run and facing the Doha traffic? For those lovely clients who have a ball to go to – why don’t you consider our Glamour Girl Ball Package and feel like Cinderella? Let us “doll you up” and you’ll be the “Belle of the Ball”. One of our amazing stylists will do your hair, followed by one of our beauty therapists to do your make up – all for only QR650. Why not bring your dress and change at the salon, then go straight to your ball? We can keep your things for you and you can collect them the following day. It will be a truly “stress free” “getting ready” experience. For those busy Mums who don’t have time to organize or arrange a party for their little princesses. Let roots take the strain and do it for you. All you have to do is turn up! roots will do the rest. Your little daughter will have a Princess Hair Style, Sparkly Nails and Dazzling Make-up with her friends followed by a cake and party bags for only QR300 per child. I think you will agree that is amazing value and you’ll have a very happy Birthday Princess too. For those young ladies going to their first Prom – let us turn you into a swan – your friends will not recognize you. No stress either; we will dress your hair to your desired style and then give you a make-over to make heads turn. You can dress at the salon and go straight to your Prom – completely hassle free for only QR650! It will be money well spent for an evening you will remember for the rest of your life. 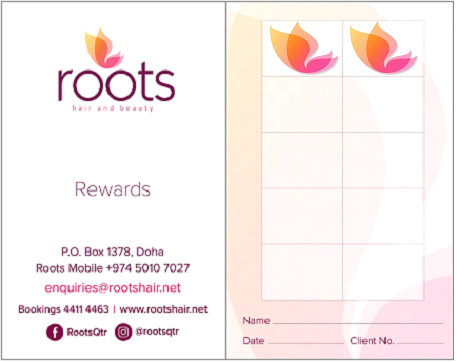 Roots has a Reward Programme because we value our regular clients and want a way to say “thank you” for your support and loyalty. For every QR300 you spend you will receive a reward stamp on your Rewards Card. Once you have collected 10 stamps you will get QR150 off any service to the value of QR300 or over.